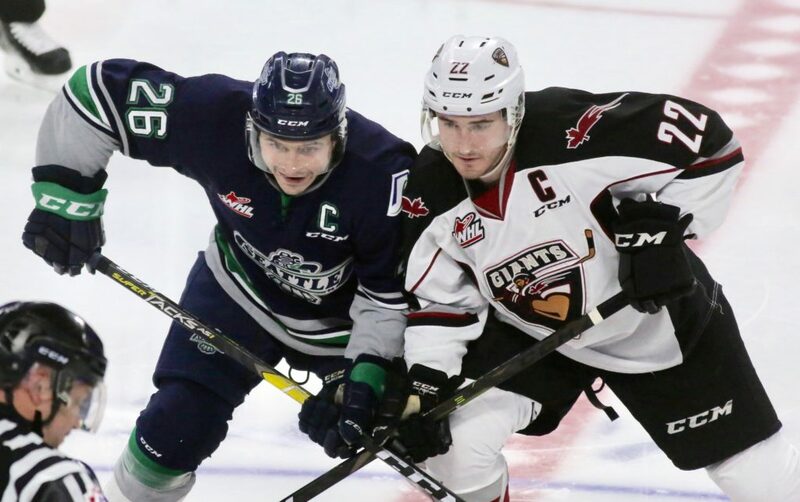 VANCOUVER, BC, March 22, 2019 — The Vancouver Giants defeated the Seattle Thunderbirds 7-1 Friday night at the Langley Events Centre in Game 1 of a first round playoff series between the teams. Game 2 is Saturday at 7pm at the Langley Events Centre. Game 3 of the first round will be Tuesday, March 26, at accesso ShoWare Center at 7:05pm and will be a 2-for-Tuesday game. All ticket and beer purchases for Game 3 are 2-for-1 and accesso ShoWare Center will feature concession specials including $2 hot dogs, $2 soda and $2 popcorn for all fans. 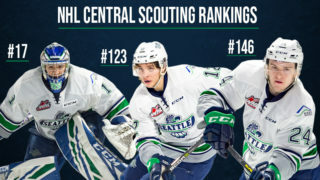 Single game tickets are on sale on the T-Birds website and at the accesso ShoWare Center box office. The box office is open Monday through Friday 10am to 5pm. Game 3 will also feature a 2-for-1 Group Ticket Special. Fans that purchase a minimum of 10 regular priced tickets will receive 20 tickets and these additional benefits. You will receive two (2) FREE tickets for putting together a group of family and friends. You will receive $10 worth of FREE Chuck a Pucks. You will receive scoreboard recognition. The T-Birds have a Group Ticket Special for Game 4 against Vancouver. Fans can purchase 10 tickets for just $220 and get two FREE tickets. You will save $185 when you purchase 10 tickets. Tickets are regularly $33.75 for the best seats. You will get them for $22 each. You will avoid all service charges. This Playoff Group Ticket Special is available by contacting one of our Account Executives, Tara Knop or Molli Ronish. 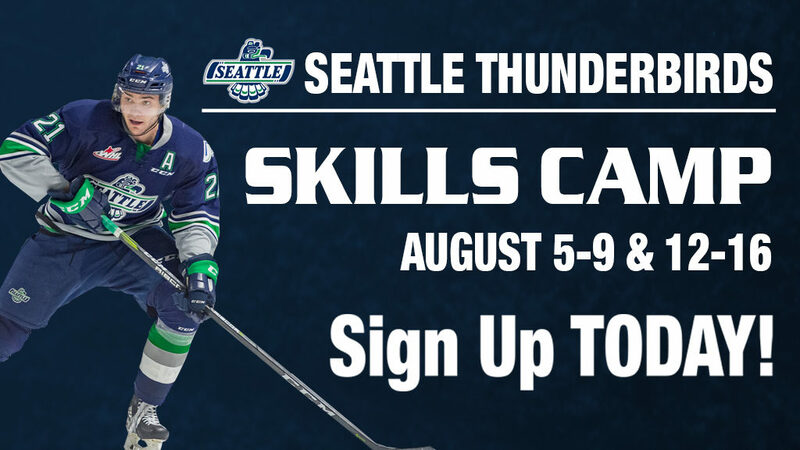 If you need more information or have questions call us at 253-239-PUCK (7825) or fill out a Ticket Information Request and a member of our staff will get in touch with you. This Group Ticket Specials is NOT AVAILABLE ON GAME DAY. They are advance purchase only. Vancouver took a 2-0 lead early in the second period on goals by Milos Roman at 1:20 and Lukas Svejkovsky at 1:43. Jadon Joseph scored a shorthanded goal at 6:47 and Dylan Plouffe scored at 16:57 to make it a 4-0 Giant lead in the second period. Andrej Kukuca got the T-Birds on the board with three seconds left in the second period. Jarret Tyszka passed the puck up the right wing to Matthew Wedman. Wedman gained the offensive zone and skated down the boards with a defenseman on his back. Wedman backhanded the puck to Kukuca in the low right circle with one hand. Kukuca quickly snapped the puck over the right shoulder of Vancouver goalie Trent Miner. Dawson Holt, Plouffe and Bowen Byram scored for the Giants in the third period. First period – No scoring. Penalties – Bench, Sea (too many men-served by Mount), 6:35. Bafaro, Van (holding), 10:11. Nielsen, Van (boarding), 13:01. Rybinski, Sea (slashing), 13:49. Tyszka, Sea (cross checking), 19:55. Second period – 1, Vancouver, Roman 1 (Joseph, Koch), 1:20 (pp). 2, Vancouver, Svejkovsky 1 (Plouffe), 1:43. 3, Vancouver, Joseph 6:47 (sh). 4, Vancouver, Plouffe 1 (Holt, Bulych), 16:57. 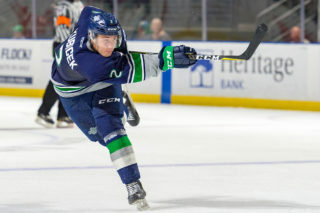 5, Seattle, Kukuca 1 (Wedman, Tyszka), 19:57.Penalties – Holt, Van (tripping), 3:20. Nielsen, Van (roughing), 5:24. Dmytriw, Van (cross checking), 9:17. Davidson, Sea (hooking) 13:43. Third period – 6, Vancouver, Holt 1 (Nielsen), 2:10. 7, Vancouver, Plouffe 2 (Byram, Koch), 4:23 (pp). 8, Vancouver, Byram 1 (Bafaro, Miner), 6:41. Penalties – McNelly, Sea (checking from behind), 2:19. Lee, Sea (interference), 2:56. Joseph, Van (roughing), 4:51. Wedman, Sea (roughing), 4:51. Kannok Leipert, Van (holding), 17:21. Bulych, Van (cross checking), 17:48. Lee, Sea (major-cross checking, game misconduct), 19:55. Shots on goal – Seattle 6-11-11 28, Vancouver 15-13-12 40. Goalies – Seattle, Ross 31 shots-25 saves (0-1), Schwebius 9-8; Vancouver, Miner 28-27 (1-0). 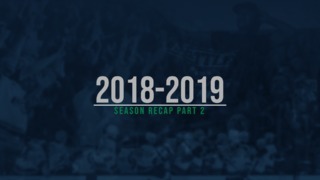 Power plays – Seattle 0-7; Vancouver 2-7. A – 3,544. Referees – Kevin Bennett, Sean Raphael. Linesmen – Nick Bilko, Spencer Lockert.